Facebook is continuing its push into the video world, announcing today that it's begun testing a video hub right inside of its own offerings. The social media giant says the new dedicated video section will be accessible via a tab on the iPhone app or on the left side of the page near the Favorites section if you're on the web. The new section will be for "people to go when they exclusively want to watch video - whether that's videos they've saved for later, or videos from friends, Pages they follow, and other video publishers on Facebook," the company said. If you think it sounds a little like YouTube, you wouldn't be wrong, and with Facebook saying that it'll help people with discovery, expect suggestions to be powered by the info you've shared with Facebook. 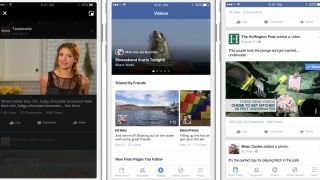 "This new videos section helps people discover, watch and share videos on Facebook that are relevant to them," the social media giant said. You may not end up seeing the new video section yet, though, as Facebook is only testing it on a small scale right now. Facebook also had a few more video-related announcements, including other features it's testing and rolling out as well. The social media giant has already rolled out a suggested content section for iOS, similar to YouTube's suggestion section, and it's set to begin rolling it out to the web, with Android to follow in the coming months. The floating videos windows that was spotted earlier this year is still being tried out as well, with the company saying, "we're testing a way for people to watch a video in a floating screen while simultaneously multitasking on Facebook." Facebook is also testing the ability to save videos to watch later, a feature it mentioned will be available in the new dedicated video section. While Facebook is still only testing a lot of these features, we're curious to see how much of a pull it will have against YouTube. Either way, one thing is clear: Facebook has a battle plan to truly take on YouTube, and it's putting it into place.